The 10th-generation Accord is new from the ground up and features a lighter and more rigid body structure, an advanced new chassis design, two all-new, high-torque direct-injected and turbocharged engines, the world’s first 10-speed automatic transmission for a front-drive car and a new generation of Honda’s two-motor hybrid technology, along with a host of new safety, driver-assistive and connected-car technologies – all wrapped in a more sophisticated, sleek and athletic design with top class interior space and comfort. In reimagining the Accord for its 10th-generation rebirth, Honda designers and engineers went back to the fundamentals of proportion and stance with a sporting and athletic appearance, like a sprinter in the blocks. 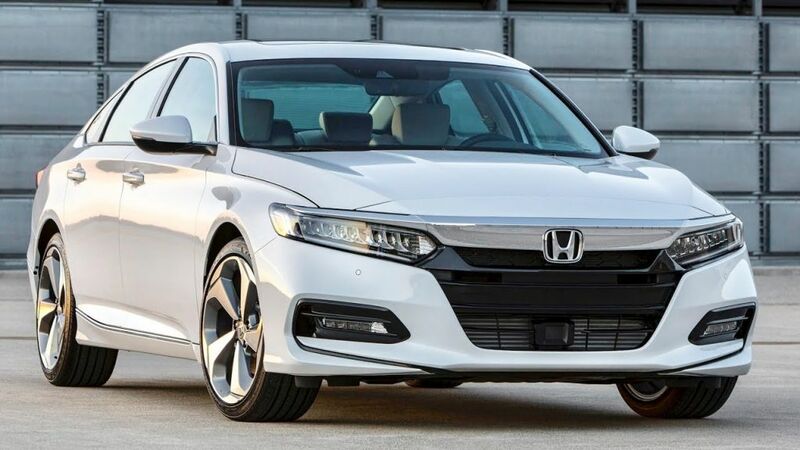 The approach reinvigorates classic Honda design principles, such as a low and wide body, expansive visibility and sporty seating position, and then translating them into a thoroughly modern, sporty and premium Accord sedan design. The new Accord features a longer wheelbase (+2.16 inches), a lower overall height (-0.59 inch) and wider (+0.39 inch) body, wider wheel tracks (+0.20 in. front, +0.79 in. rear), a shortened overall length (-0.39 inch) and lower, sportier seating position (-1.0 inch front and -0.79 inch back). A sweeping greenhouse positioned farther back on the body completes the new stance and proportion of the next-generation Accord. The combined effect of these changes is a more premium look, highlighted by shorter overhangs, a bold front fascia, a long and low hood, and a visual center of gravity moved closer to the rear wheels. Viewed head-on, the new Accord’s greenhouse also angles in more dramatically from the window sills to the roof, further emphasizing the wide lower body, while inside the cabin the seats have been moved slightly inward that contributes to improved hip, shoulder and head room while enhancing occupants’ freedom of movement. Also, the longer wheelbase allowed designers to move the second-row seats substantially rearward, giving Accord almost 2 extra inches of rear leg room to offer one of the most spacious rear seating areas in its class. Overall passenger volume is increased by 2.5 cubic feet to 105.7 (based on LX). Trunk space has also been increased by nearly one cubic foot on the 1.5-liter and 2.0-liter engine powered Accords and by 3.2 cubic feet on the Accord Hybrid to a top level 16.7 cubic feet (+0.9 cu.ft.). Elegant and modern exterior detailing compliments the Accord’s new, more dynamic design. The bold and upright front fascia is highlighted by Honda’s signature chrome wing front grille positioned above a large main air intake and flanked by available 9-lamp full-LED headlights and LED fog lights. The chiseled hood features a distinctive and aggressive raised center, and the deeply sculpted body sides enhance the visual length and strength of the lower body. Further, a new laser brazing process that joins the dramatically arching roof to the body side panels creates a clean appearance with no garnish over the rain channels. The similarly low and wide rear view is finished off with an upswept decklid, distinctive LED light-pipe taillights and cleanly integrated dual exhaust ports. Overall aerodynamic efficiency is improved by approximately 3 percent (based on EX trim) to make it the most streamlined Accord yet. The 2018 Accord also boasts a larger, more premium and tech savvy interior that compliments its athletic and elegant body design, delivering a level of quality and premium feel that belies Accord’s mainstream sedan status. The new Accord features a panoramic forward view that is enabled by its lower cowl and by front roof pillars that are 20 percent narrower and moved rearward relative to the driver’s seating position. The new soft-touch instrument panel features an ultra-thin profile and three-tier design with a strong upper deck that describes a continuous arc from its outboard section through the side door sills, giving a sense of strength and visual continuity. A more intricately contoured sport inspired steering wheel with deep-set thumb rests and available paddle shifters compliment the Accord’s more sophisticated and sporty performance capabilities. Meticulous attention to the tactile and visual quality of surface materials and decorations communicates modernity and soft-spoken elegance throughout the cabin. The inboard positioning of the seats provides for improved freedom of movement and is complimented by longer, wider and more deeply padded arm rests, front and rear; while the Accord’s newly designed seats feature taller shoulder bolstering for a more premium appearance and improved lateral support. New high-accuracy seat padding with variable firmness improves seating comfort and support. The driver’s seat now has available 12-way power adjustment with height-adjustable lumbar support, and passenger comfort is further enhanced by available new heated and ventilated front seats and by improved available rear seat heating with both seat bottom and seat back heating elements. The tech-savvy and easy-to-use 2018 Accord cabin also features an all-new HMI that includes an ultra-slim 7-inch TFT driver’s meter and a new 8-inch Display Audio touchscreen interface with physical volume and tuning knobs and more intuitive, smartphone-like features and functionality including customizable app tiles and home-screen shortcuts, along with Apple CarPlay™ and Android Auto™ compatibility. The Accord also will offer the next-generation of HondaLink telematics with new capabilities including emergency roadside assistance, remote locking/unlocking and engine start, stolen vehicle tracking, remote diagnostics, geofencing, speed tracking and more. Touring trims of both 1.5-liter and 2.0-liter models also feature a new 6-inch driver’s Head Up Display with selectable information, including speed, engine rpm, turn-by-turn navigation, and Traffic Sign Recognition. Additional new or improved connected-car technologies available on the 2018 Accord include wireless device charging, automatic Bluetooth® phone pairing with Near Field Communication technology, 4G LTE in-car Wi-Fi, and Wi-Fi-enabled over-the-air system updates. Audio systems vary by trim, starting with 4 speakers and 160 watts on LX, 8 speakers and 180 watts on Sport and EX trims, and 10 speakers and 450 watts on EX-L and Touring trims. All models feature USB charging ports (two 2.5-amp ports on EX and above) along with Bluetooth connectivity. The 2018 Accord takes an entirely new approach to performance by featuring three advanced new powerplants – two direct-injected and turbocharged 4-cylinder engines and the third generation of Honda’s two-motor hybrid powertrain technology. The 2018 Accord also features a new Honda-developed 10-speed automatic transmission (10AT) with the 2.0-liter turbo engine, the first of its kind for a front-wheel-drive car, and an available 6-speed manual transmission for both turbocharged engines. The new 1.5-liter, 16-valve DOHC direct-injected turbo with dual Variable Timing Control (dual VTC) produces a peak 192 horsepower (HP) at 5,500 rpm and 192 lb-ft. of torque from 1,500 to 5,000 rpm, up from 185 HP at 6,400 rpm and 181 lb.-ft. at 3,900 rpm on the existing, normally aspirated 2.4-liter model. The new 1.5-liter turbo is mated to a Honda continuously variable automatic transmission (CVT) or, in Sport trim, to a CVT or a 6-speed manual transmission (6MT). The Accord can also be equipped with a new 2.0-liter 16-valve DOHC direct-injected turbo with i-VTEC® valvetrain paired with a 10-speed automatic transmission or, in Sport trim, to the 10AT or an available 6MT. The new 2.0-liter turbo, sharing much of its design with the race-bred 2017 Civic Type R, produces 252 HP at 6,500 rpm and 273 lb.-ft. of torque from 1,500 to 4,000 rpm, compared to 278 HP at 6,200 rpm and 252 lb.-ft. at 4,900 rpm for the 3.5-liter V6 that it replaces. Both turbocharged engines utilize a host of new technologies, including high-efficiency low-inertia turbos, variable valve timing, low-pressure-loss air intake and high-accuracy direct injection, to deliver immediate and powerful response along while still anticipated to receive top level fuel economy ratings. The two new automatic transmissions – the CVT for the 1.5-liter engine and new 10AT for the 2.0-liter engine – take greater advantage of available torque while maximizing quietness and efficiency during highway cruising. The redesigned CVT has an 11 percent lower ratio compared to the current version for more powerful launch performance, while the new 10AT is 22 lbs. lighter, has a 68 percent wider overall ratio range with a 43 percent lower first gear, and a 17 percent taller top gear compared to the current Accord’s six-speed automatic. An all-new, even more refined and fuel efficient Accord Hybrid will be again built in Marysville, Ohio after a couple of years of production in Japan, and will be powered by the third-generation of Honda’s innovative two-motor hybrid technology, offering improved power delivery with no compromise to interior or cargo space and packaging. The new hybrid powertrain will utilize a 2.0-liter Atkinson cycle engine with greater than 40 percent thermal efficiency, the highest for any mass-produced Honda engine, paired with Honda-developed electric motors that are the first drive motors in the world to use magnets containing no heavy rare-earth metals. As before, the Accord two-motor system operates without the need for a conventional automatic transmission. Additionally, a new, more compact intelligent power unit (IPU), containing the hybrid battery pack and its control systems, is now mounted under the rear floor instead of in the trunk, preserving both cargo space (16.7 cu.-ft.) and the flexibility of a 60/40-split and folding rear seat, standard on all models and trims. Detailed specifications on the 2018 Accord Hybrid, including power and fuel-economy ratings, will be release closer to launch. The 2018 Accord’s new body structure is lighter and more rigid, utilizing 29 percent ultra-high-strength steel, the most extensive application of this weight-saving material in any current mass-produced Honda car. Overall, the new Accord employs 54.2 percent high strength steel (above 440 MPa). Key body features include the latest generation of Honda’s Advanced Compatibility Engineering™ (ACE™) body structure with crash stroke front frame, tailor-tempered rear frame members for improved crash-energy absorption, and the extensive use of structural adhesives for increased rigidity, cabin quietness and weight reduction. Total vehicle weight is down between approximately 110 to 176 pounds, depending on trim, while body torsional and bending rigidity are improved 32 and 24 percent, respectively, aiding ride quality, cabin quietness, and dynamic performance. Mated to the new body is a more sophisticated new chassis design. The 2018 Accord’s lighter chassis features a new Macpherson strut front suspension with L-shaped aluminum control arms mounted to an all-aluminum front subframe. The new setup better isolates and manages varying road inputs, improving handling precision, ride quality and cabin quietness along with outstanding high-speed stability and control. The new, more space-efficient rear suspension is a multi-link design mounted to a more rigid, floating rear subframe. Fluid-filled compliance bushings at all four corners further improve ride comfort and absorption of road irregularities, and all new Accords also feature, for the first time, an Adaptive Damper System with the ability to adjust shock absorber damping force every 1/500 of a second, providing for a more compliant and controlled ride in all driving situations. The new Accord has a 10 mm lower center of gravity. The adoption of lighter-weight turbocharged engines and other body design changes reduce the vehicle’s moment of inertia, resulting in crisper turn-in and steering response. All models now have near optimal FWD weight distribution of approximately 60/40 (front/rear). Accords with the new 2.0-liter i-VTEC turbo and 10AT check in at approximately 61/39, a significant improvement versus the current V-6 and 6AT Accord. All new Accords will now come equipped with a Two-Mode Driving System featuring Normal and Sport settings, allowing the driver to dial-up/down the vehicle’s sporty reflexes depending on the driving environment. The system engages with multiple chassis and drivetrain components, including the new dual-pinion variable-ratio electric power steering (EPS), automatic transmission, drive-by-wire throttle, adaptive dampers and Active Sound Control system, to provide the driver with an expanded range of driving characteristics. An ECON mode is also available that helps improve fuel efficiency by modifying throttle mapping and HVAC operation. Along with the first application of structural adhesives to Accord, cabin quietness is further enhanced by a comprehensive sound-insulating package that includes full underbody covers, which also aid aerodynamics, front and rear fender and engine compartment insulators, alloy wheels with Honda-proprietary resonator technology, sound-absorbing carpet, acoustic laminated windshield glass – plus front door acoustic glass on EX and above – and a new, three-microphone Active Noise Control system. For 2018, all Accords will feature the full suite of Honda Sensing® safety and driver-assistive technologies as standard equipment. Honda Sensing includes Collision Mitigation Braking System™ (CMBS™), Lane Departure Warning, Road Departure Mitigation, Adaptive Cruise Control with Low-Speed Follow and new Traffic Sign Recognition. Additional available driver-assistive technologies include Blind Spot Information, front and rear parking sensors, Cross Traffic Monitor and Driver Awareness Monitor; and all models feature a Multi-Angle Rearview Camera with dynamic guidelines. Standard advanced active and passive safety systems include Vehicle Stability Assist with Traction Control, Anti-lock brakes with Electronic Brake Distribution, Tire Pressure Monitoring System (TPMS), advanced front airbags, driver and front-passenger side airbags and new driver and front-passenger knee airbags. The Accord targets top U.S. government (NCAP) and IIHS collision safety ratings. More detailed information will be provided closer to launch, but the 1.5-liter powered Accord will be available in six trims – LX, Sport, EX, EX-L, EX-L Navi and Touring. The 2.0-liter model has four trims available, which are Sport, EX-L, EX-L Navi and Touring. And the new Accord Hybrid will be available in five trims – Hybrid, EX, EX-L, EX-L Navi and Touring. Sport trims for both 1.5-liter and 2.0-liter engine variants will now feature available short-throw 6-speed manual transmissions. All variants of the 2018 Accord will be produced at Honda’s Marysville, Ohio auto plant2, at which the company is investing with numerous enhancements to further advance quality and efficiency, including the introduction of additional technologies and processes. Accord was the first vehicle from a Japanese automaker to be made in America and has been in continuous production at the Marysville Auto Plant since November 1982, with cumulative U.S. production exceeding 11 million units over 35 years. The 2018 Accord’s 1.5-liter and 2.0-liter turbo engines will be produced at Honda’s Anna, Ohio engine plant, and its CVT transmission will be manufactured at the company’s Russells Point, Ohio plant. The all-new, Honda-designed 10-speed automatic transmission will be produced at the company’s Tallapoosa, Georgia plant2. Honda recently announced a combined $149 million investment in the Russells Point and Tallapoosa plants to facilitate production of the new 10AT. Additional details concerning new manufacturing technology and investments will be announced closer to launch.